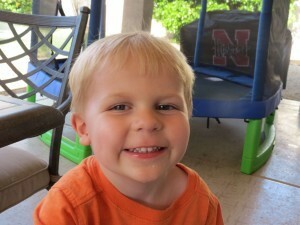 This story was written by Ryker’s mother, Kim. “I took my son to his 3 year check up in June 2014. Our pediatrician spent some time looking at his eyes. She went back and forth with her light. She said she was going to refer him to the eye specialist because she noticed a slight lazy eye just to be on the safe side. After talking with co-workers, I figured he would be getting a patch to correct the lazy eye. Three weeks later, we went to the eye appointment. We begin the eye appointment with the eye test. Ryker sat like a big boy in the chair while he read perfectly all the pictures on the TV like he always did at home. She covered his left eye. The nurse asks him to read the pictures again. Nothing. The nurse covers his right eye, and Ryker reads everything on the screen again with just his left eye. She switches back over. Nothing. She puts fingers right in front of him. He couldn’t read them. Ryker could not see anything with his right eye. I was shocked, and my heart sank. She puts drops in and we wait for the doctor. A few minutes later the doctor comes in. He begins his examination and after a few minutes, he says that he would like a second doctor to take a look at it. The second doctor comes in and examines Ryker. After the two doctors discuss, the first doctor comes back in to tell us that they think it is Coats Disease. I said, “What’s that?” He goes on to explain and the tears began. They set us up with a retina specialist for the very next day with Dr. Bryan, at the Associated Retina Consultants. That night we looked up all we could about Coats Disease and letting family members know. This is where we found your foundation’s website. The next day, we go through a similar process and Dr. Bryan agreed that it was Coats, but wanted to do a further exam under anesthetics. After a couple days of learning about the disease, I decided to get my camera out to see if there were any pictures of Ryker that had that glow that I read about. There were 900 pictures in my camera. I went through every single one. Sure enough, I came to the first one. Ryker’s 3rd birthday, opening presents in the living room, saying “Cheese.” His right eye showed the yellow glow, and I didn’t even pay attention to it when I was taking the pictures. I found only two more pictures with the glow.